Corporate INTL Magazine has chosen McManus & Associates, a Tri-State area-based trusts and estates law firm, as the winner of the 2012 Corporate Intl Magazine Global Award for Asset Protection Law, Firm of the Year in New Jersey. The nomination, research and judging process took a full 12 months. Established in 2005, Corporate INTL is one of the leading monthly titles for business leaders, professional advisers and providers of finance throughout the world. The publication, distributed to over 70,000 readers each month, offers unique business insight with discussion on domestic and international matters from leading experts. Corporate INTL’s Annual Awards celebrate excellence with recognition of the world’s top advisors and financiers across an array of countries around the globe. The awards honor those who have been active over the past year and who have demonstrated merit not only in expertise, but also in service. To view all recent honors and recognitions received by McManus & Associates, visit https://mcmanuslegal.com/about-us/honors-and-recognitions/. We look forward to the opportunity to help protect your assets and family. Sharing his expert knowledge for an article taking a closer look at the estate planning techniques used by GOP nominee Mitt Romney to minimize taxes and build millions of dollars in wealth, McManus & Associates Founding Principal and Attorney John O. McManus recently spoke with Bloomberg Reporter Margaret Collins. The Romneys also set up a charitable remainder unitrust in 1996, according to state financial disclosure documents. The trust, also known as a CRUT, moves money out of an estate by donating it to charity and has two additional benefits for the creator, said John O. McManus, principal at the law firm McManus & Associates in New Providence, New Jersey, and New York. The maker of the trust receives some tax deduction for the value that is expected to go to charity and receives payments from the trust for a set period before the assets transfer, McManus said. Read the whole story here. The team of lawyers at McManus & Associates would be happy to discuss the techniques used by the Romneys and develop a plan to help you protect and build your family’s wealth. We are excited to share that McManus & Associates Founding Principal John O. McManus has been named one of New Jersey’s Top Rated Lawyers by Inside Jersey: The Star-Ledger Magazine’s “Best of NJ” issue for August. The honor also appeared within The New Jersey Law Journal. We invite you to check out the feature in print on page 21 of Inside Jersey. A preview of the section on recommended law firms and attorneys in New Jersey can be found online here: http://www.law.com/jsp/law/ads.jsp?p=newjersey_reprints. 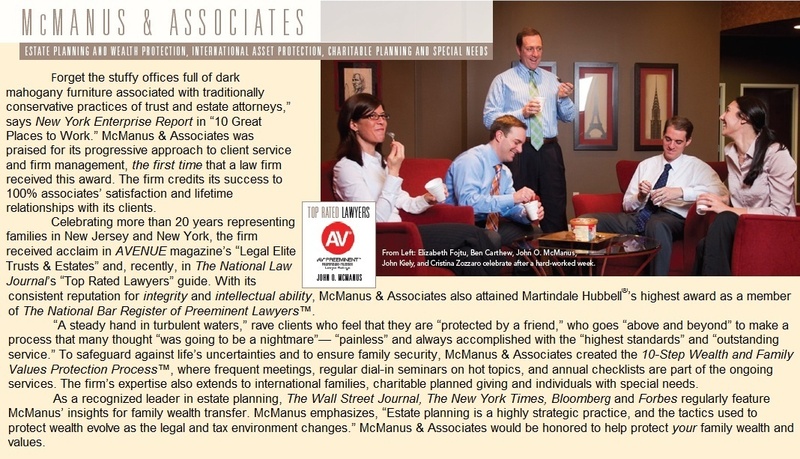 As mentioned in the piece, the McManus & Associates family is honored to help protect your family wealth and values. 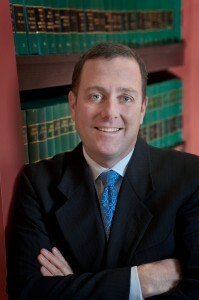 McManus & Associates is excited to announce that the firm’s founding principal and estate attorney John O. McManus has been awarded membership in the Society of Trust and Estate Practitioners (STEP), which is the leading worldwide professional body for practitioners in the fields of trusts, estates and related issues. The firm is honored by this professional qualification recognized by the industry. McManus & Associates looks forward to taking advantage of the education, training, representation and networking provided by the Society of Trust and Estate Practitioners. Derek Sankey, reporter for The Calgary Herald, has put together an interesting article titled “Taxes create cross-border issues” that was today published by The Vancouver Sun. Non-U.S. citizens and Americans with property overseas are also faced with another set of challenges when it comes to the changing estate and tax planning environment, according to New York based John McManus, of McManus and Associates. His firm released a report this month highlighting the implications. “Protecting your wealth and your family as an immigrant is a unique, complex process that requires consistent surveying of the landscape for changes in estate and tax planning,” McManus says. To read the full story, click here. For help with your cross-border tax and estate planning issues, call our New York office at (212) 753-9000 or our New Jersey office at (908) 898-0100.